Ligularia's are one of my favorite plants with their architectural statement. I always loved Ligularia’s and it is not surprising that I transplanted a few from our former garden to the Tank Garden. In the nineties of the last century I ordered them as Ligularia clivorum. Probably a name I found in some of the older books on gardening from the bookshelf but which was then already changed in Ligularia dentata. Nowadays considered as old fashioned, I find them very useful in plant schemes where there is a need for large architectural forms. I think its unpopularity has to do with the daisy-like brash orange coloured flowers. 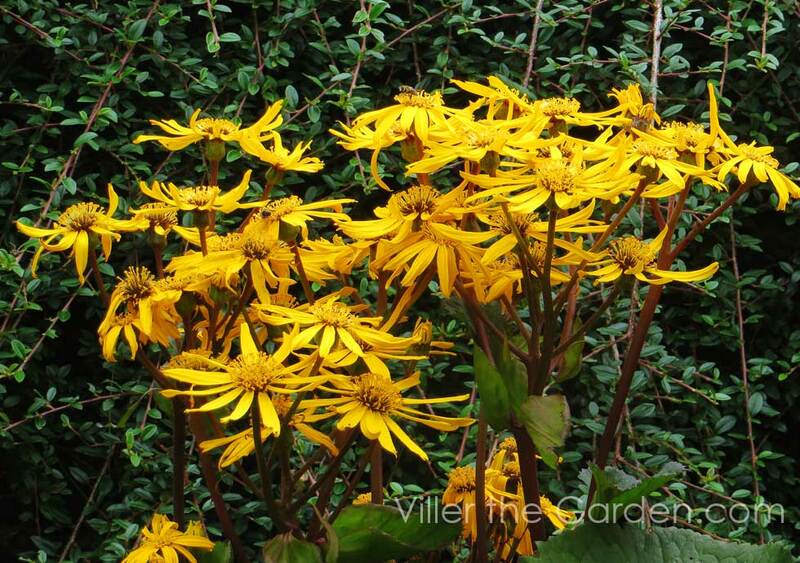 Ligularia’s are flowering in late summer and that is exactly the time that we desperately need some colour. At the same time, the deep purple stems make a wonderful combination with the warm orange colour of the flowers. Ligularia’s enfolding their large leaves in April and I had to transplant some Spanish bluebells (Hyacinthoides hispanica) otherwise they would be completely covered by the time this lovely bulb wants to show us all his beauty. The enfolding large leaves are brown red colored but changing to a dark green and are a nice companion to the feathered leaves of the neighboring ferns. Nowadays considered as old fashioned, I find them very useful in plant schemes where there is a need for large architectural forms. I think it has to do with the daisy like brash orange colored flowers. Ligularia’s are flowering in late summer and that is exactly the time that we desperately need some color. At the same time the deep purple stems makes a wonderful combination with the warm orange color of the flowers. Ligularia’s enfolding their large leaves in April and therefore I had to transplant some Spanish bluebells (Hyacinthoides hispanica). As a result, these lovely bulbs are able to show us all their beauty in spring. The enfolding large leaves are brown-red coloured but changing to a dark green and are a nice companion to the feathered fronds of the neighbouring ferns. Ligularia’s are imposing plants which need moist retentive soil. So here on the sandy soil I have to water them on hot summer days. 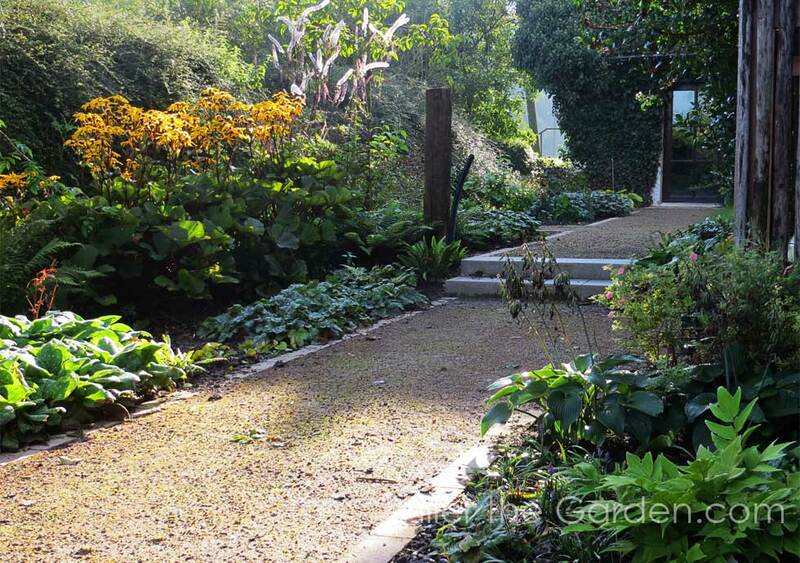 The large leaves will thank you if you give them a sheltered shady position. Here in Viller we planted Ligularia dentata ‘Desdemona’. 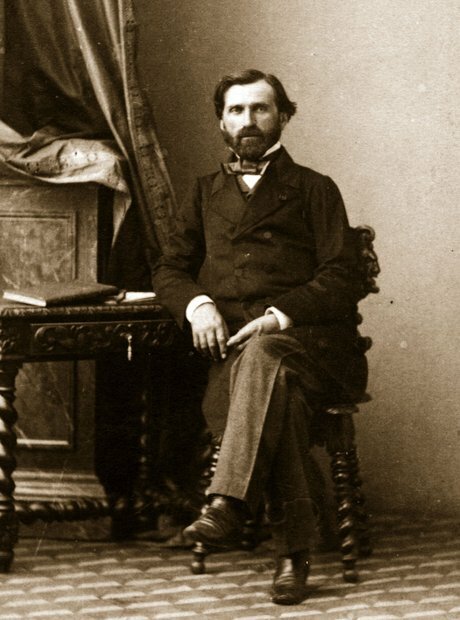 ‘Desdemona and ‘Otello’ are both creations of Georg Arends and are the leading roles of Giuseppe Verdi’s opera Othello. 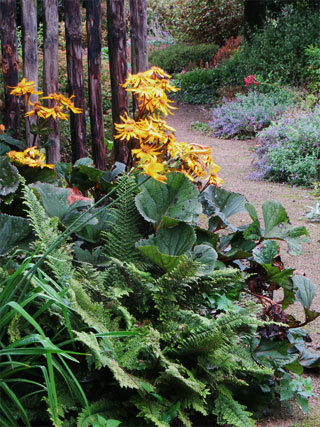 Ligularia’s and ferns are typical woodland plants. 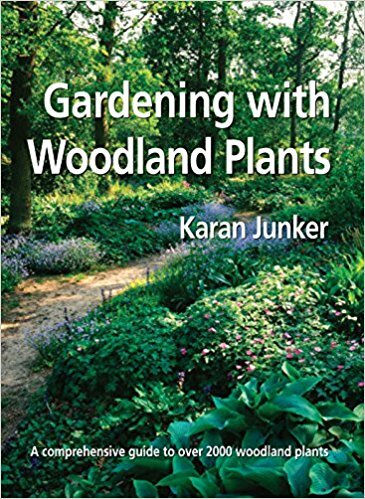 In my blog on Astilbes, I already mentioned this outstanding book written by Karan Junker with is depicted below. Highly recommended! The haunting Ave Maria at the end of Verdi’s opera Otello is often performed by fairly buxomly stout soprano’s. Staged in some medieval sleeping room with a four poster bed, the soprano tries to bend her knees on the eternal used kneeling chair in order to mumble the delicate words of the prayer with her quite heavy voice. The young Marina Poplavskaya though is singing her Desdemona on a empty stage in front of a burning candle. Her singing is simply great. From the carefully pronounced words at the beginning till the breathtaking ‘amen’ at the end. 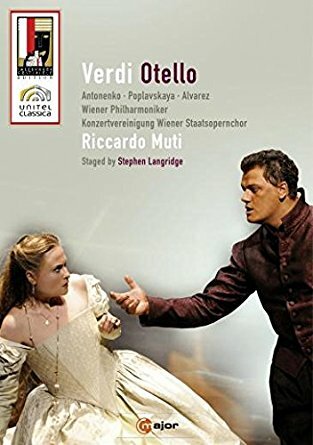 Watch the moment at the end where Desdemona tries to reach the light of the candle as a symbol of eternal light and shortly before she will be killed by her husband Otello.